Your home is probably your largest investment. To keep your home in great shape and to prevent large unexpected repairs, checking and inspecting it seasonally and making small maintenance tasks and repairs all year long is recommended. It will give you time to plan and budget for the larger, more costly ones. Making seasonal inspections and preparing for the coming season will help your home stay in great shape and you plan for more expensive repairs before the season is upon you. Its the end of Summer. Storing away the lawn mower and gardening tools as well as protecting the outdoor sprinkler and water pipes will have them ready to go when Spring arrives. This may include wrapping outside pipes and faucets with insulation to protect them from cold, harsh weather experienced during the Winter season. If maintenance and repairs are beyond your abilities, call a professional. This includes inspecting your heating and cooling system if you have central heat to ensure that your system is properly cared for before its time to turn it on. You can also save on your heating bill and prevent your system from working harder than it should be checking your windows and doors for cracks that need sealing and gaps that need caulking or weather stripping. Since Fall is the season with falling leaves, as you deal with them by raking and bagging or using your lawn mower, remember to check gutters and down sprouts and remove leaves and debris. Clogged gutters and down sprouts can cause water to settle around the base of your house, causing potential damage. Another seasonal maintenance task that can protect your main sewer line is treating your basement drain and downspouts with copper sulfate to control tree roots. If you suspect that tree roots may be in your sewer line, you need to contact a professional such as Relining Company sewer repair services. Pay attention to cracks and gaps in the drive and walkways as well as in the basement and walls on the interior. Repair any loose siding and damaged or weaken the wood. Your inspection should be from top to bottom on the inside and outside of your home. Check your roof on the outside for damaged or missing shingles as well as pests that may be hiding in vents. Check inside the attack for signs of leaks and animals, such as raccoon and squirrels, that may have taken up habitation and make sure insulation is intact. If you have a chimney, check for damage, such as damaged or bricks and mortar that may need repairing, a build-up of soot and pest. Check kitchen and bathrooms, making sure fixtures are in good repair and check under cabinets for leaks and water damage. There may be a need for re-caulking or re-grouting. There also could be signs of water damage on ceilings and walls. Make sure that your smoke and carbon monoxide detectors are in working order. There should be a smoke detector on every floor of your home. Electric water heaters and water radiators should be drained to keep them working properly. During the Winter, you may plan in some of the indoor maintenance and upkeep of your home. If you have noticed water damage on ceilings or walls, hopefully, you have found and repaired the cause and it is the perfect time to now apply a new coat of paint. Clean or replace air filters monthly during the Winter months. Make sure you have your Winter supplies on hands such as gas for the snow blower, salt and ice melt. You also want emergency supplies, including a battery operated radio, flashlights, canned foods and bottled water, in case of a power outage. During these seasons come the best time to make repairs on the exterior of your home. During Spring, as you are making your gardening and landscaping choices, you also want to inspect for damage, as during the Fall, and make repairs. Make sure outside water sources are in good repair. You want to keep your home cool and dry during the upcoming months. Make sure the cooling system is ready to go, whether central air or window air conditioners. 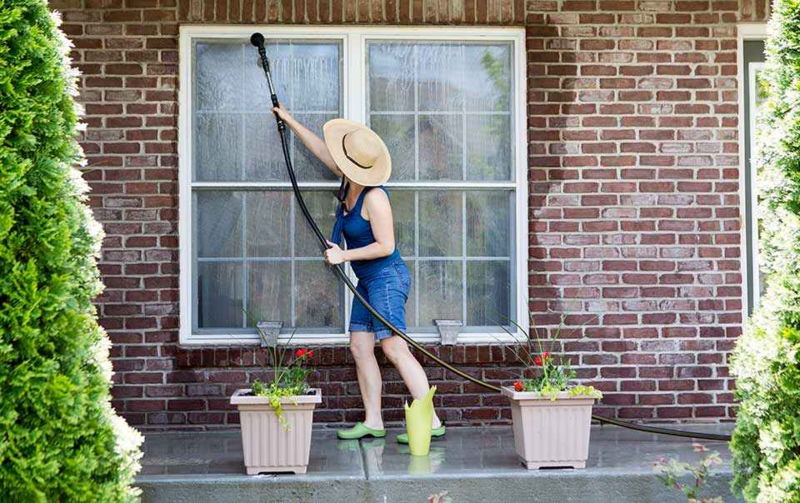 During Summer, outdoor and indoor maintenance can be done to contribute to the year-round upkeep of your home, such as cleaning carpets and waxing floors on the inside and painting the exterior where needed. Inspect for pests such as ants, termites or rats. Oiling garage door parts outside and door hinges on the inside could be a seasonal activity as well as vacuuming refrigerator coils and dryer vents. Once you have your yearly routine in place, it will be easier to upkeep the value of your home by using your yearly maintenance activities to save money and budget for the small things to avoiding unexpected huge repairs cost.